Reverse SEO fits seamlessly within the context of your online reputation management (ORM) program. It is the quickest, most effective solution for dealing with bad press that has surfaced on the search engines about you or your company. By pushing negative listings from the front page of Google, Yahoo, and Bing, reverse SEO shields you from the damaging commentary of others. Negative publicity online has become one of the most frustrating challenges for companies. It is typically anonymous. Names are often unattached to forum threads, blog posts and even entire websites. Therefore, it is difficult to track and address the source of the complaint. Moreover, the growing popularity of social networking platforms has made it easier than ever for anyone with a mild grievance to give weight to their grudge. If you or your company have been the target of bad press online, it may be time to launch a reverse SEO campaign. To appreciate why reverse SEO is effective, you should understand how negative press takes root within the top search listings in the first place. Google, Yahoo and Bing rank pages based on a large number of criteria. If a website and its individual pages satisfy the most important of those criteria, those pages will rank well. A lot of the bad press that targets companies (possibly even yours) is placed on websites that meet key ranking parameters in the search algorithms. That means the negative publicity can climb into the top positions and gain exposure. When people search for you or your company, they’ll see the bad press. That damages your reputation. 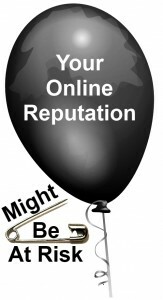 Like search engine marketing, reverse SEO uses a methodical, multi-pronged approach to protect your online reputation. The first step is to identify the sites and pages that contain negative publicity about your company and that are ranking for important keywords. Those keywords might include your name, that of your company or key employees. The second step of reverse SEO is to analyze those sites and pages for their respective ranking authority. That will help you determine the effort and tools you’ll need to use in order to move them from the first page of listings within Google, Yahoo and Bing. A negative PR blitz that is spreading across social networking sites is more difficult to overcome than a single blog post that is on a non-authoritative domain. Negative press can spread rapidly as people attach the press to their own blogs, sites, forums and social media accounts. That creates a growing portfolio of links pointing toward the damaging press, cementing its position in the top listings. It becomes more difficult to address. By launching a reverse SEO campaign upfront, you can prevent the negative publicity from gaining exposure in the first place. Reverse SEO should play a key role in your online reputation management program. It is far too easy for unsatisfied customers, resentful employees, lazy journalists and malicious competitors to tarnish your name. And when it happens, it is usually done under the cover of anonymity. Anonymity makes the complaint or grievance impossible to address in private.